When we decided months ago to devote an issue to Islam and the arts, I rather hoped (the kind of hope that comes without optimism) that the urgency of our subject matter would have passed by the time we prepared the issue for the printing press. However, just as we are finalizing this issue, the news is filled with sounds of sirens rushing from the Brussels airport, where another thirty-one are confirmed dead, and where hundreds more have been injured. In the same sequence of media reports, a political candidate offers solutions from the stump that are reminiscent of the 1940s, with that decade’s reliance on internment camps as the means to deal with its scapegoats. 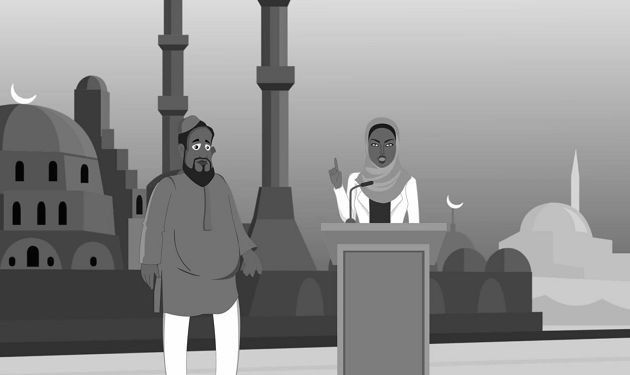 This Islamophobic noise makes all of us, Muslims especially, exponentially less safe. Even as I write, I am mindful, too, of those Muslims who have been killed in Africa and the Middle East as the result of airstrikes carried out under the flag of my country. Violence is conducted under many ideologies in our day, and no path to peace is yet within sight. I am writing this column from my office in Minneapolis/St. Paul. Also known as “Little Mogadishu,” our area has absorbed more than 30,000 immigrants from Somalia, and is host to the largest Somali population in the United States. Somalis are seeking refuge here from ongoing civil strife in their country, discord that is linked to the political vacuum that emerged beginning in the 1960s when it was decolonized from England and from Italy, and where politicians, militias, and revolutionaries alternately and sometimes simultaneously have vied for control ever since. Our local newspaper, the Star Tribune, has covered the recruitment of about fifty local Somali youth into Al-Shabab, which literally translates into “Mujahideen Youth Movement,” or movement of youth doing jihad. Founded in Somalia, it joined with al-Qaeda in 2012, and has conducted a number of high-profile attacks, most infamously in September 2013 at the Westgate Shopping Mall in Nairobi, Kenya. For a time, recruits from Minnesota were thought to have been involved in this attack, though this was later shown to be false. Though far less widely reported than the story of those who have been recruited, the Somali community has mobilized to resist the efforts of Al-Shabab. Ka Joog, for example, is a local non-profit organization that “encourages Somali youth to ‘ka joog’ or ‘stay away’ from” drugs, violence, and radicalization, to attain a higher education, and to engage in the wider community. The organization wishes to “provide positive outlets for feelings and experiences,” particularly by encouraging expression “through the arts—music, poetry, visual arts, drama, and other media.” In the work of some of its artists, religious extremism is openly challenged and nonviolent political engagement is encouraged. In a similar vein, Somali-American documentary filmmaker and journalist Fathia Absie has turned her gaze to her own Somali community in Minneapolis. She was fourteen years old in 1988 when she arrived in the United States with a visa that she had acquired with forms given to her through a friend of a friend of a friend, and for which she had paid by stealing her mother’s jewelry. Unfortunately, the visa expired eight hours before her plane landed at Kennedy Airport. When Fathia broke into tears, the customs agent overlooked the expiration, and told her to run into the country. She did, subsequently flying to the Reagan Airport where she kissed the airport’s walls since, she thought, kissing the ground would look peculiar. Soon thereafter, the Civil War broke out in Somalia, and she was given asylum in this country—enabling her to sponsor her parents and ten of her siblings who were, likewise, seeking refuge. Eventually, she would become a journalist, working for Voice of America for the Somali world service. 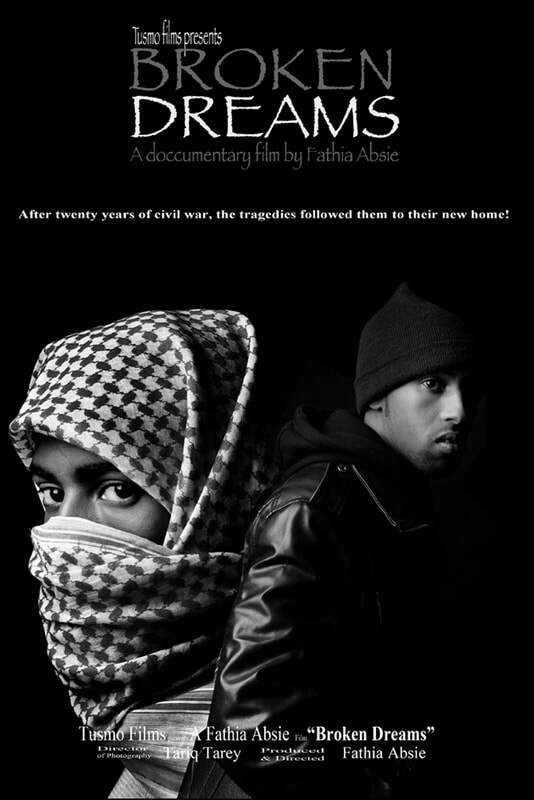 Absie’s first feature film, Broken Dreams, is about the Somali men from Minnesota who joined Al-Shabab. Absie explores the impact of their decision to return to fight in Somalia on the community they left behind. She says of the work, “It was very intriguing to me and it didn’t make sense why young men who had so much going on would want to give up everything and fight in a senseless war.” In the film, she interviews community activists, imams, youth, FBI officials, and intellectuals, to reveal the difficulties Somali youth are facing as they attempt to integrate and identify as American in their new context. 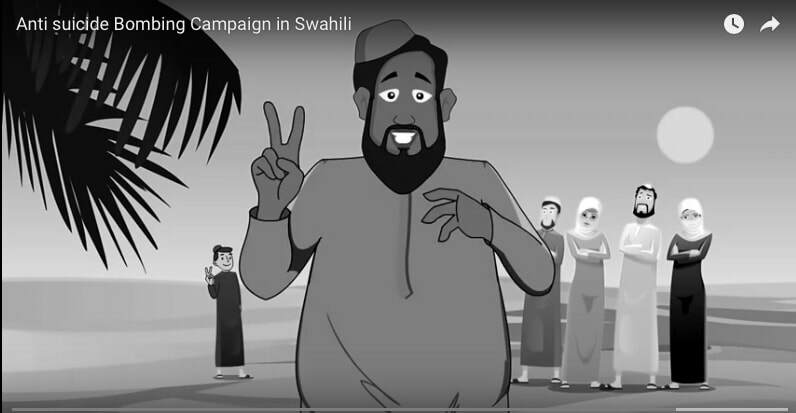 In the film, Somali Americans discuss how their culture and religion have been misrepresented in the media. They also express anger at how the peaceful religion has been co-opted by Al-Shabab. Elders in the community grieve that these boys have gone off to fight in a war they scarcely understand. And most poignantly, mothers of the recruits express their anger. These mothers lament that their sons were deceived, manipulated, and exploited. But they are unsure where to locate the blame. The FBI has found no evidence of a genuine connection between the mosque’s leadership and Al-Shabab, though in 2012, a janitor from the Abubaker Islamic Center was sentenced for aiding a terrorist group. Perhaps the young men were motivated by the President of Somalia. When he visited Minnesota in 2013, and spoke in front of an audience numbering over 4,000, he encouraged young men to come back and help rebuild their war-torn homeland. Many in the community suspect, Fathia told me, that the boys found videos online, like The Path to Paradise from the Twin Cities to the Land of Two Migrations, and answered the call. The video appeared for a time on YouTube. Recruits interviewed in the film testified that involvement in the group was “fun,” and likened it to Disneyland. Fathia herself believes it is those who were born in the United States who are most vulnerable to Al-Shabab’s recruitment tactics, for they are too young to remember how Somalis were destroying one another at home, she told me in an interview. Struggling to integrate in a very segregated Minnesota, growing up without male role models in their homes, and with misery compounded by poverty, Fathia believes these young men are vulnerable to the suggestion that they will find a niche in the construction of a new Somalia. She hopes that, by encouraging open dialogue in her film, Somali-American parents will speak to their children, assuring them that they are first-class citizens who belong here, thereby helping to make them less vulnerable to recruitment efforts of those who have embraced violence. Artists in “Little Mogadishu” are demonstrating how we might live into a vision that Judaism, Christianity, and Islam share, a vision of a restored Eden also called the New Jerusalem by the Hebrew prophets (Ezekiel 48:35), the City on the Hill by Jesus (Matthew 5:14), the ideal caliphate according to the Prophet Muhammad (Qur’an 2:30)—a vision of what elsewhere I have called “Beauty’s Vineyard”: a community of justice and of righteousness, of peace and loving kindness which is, according to a prayer Jesus taught his disciples, “on earth, as it is in in heaven.” By creating documentaries that allow audiences to enter more deeply into the experience of the communities made most vulnerable to the propaganda of Al-Shabab and its affiliates, Fathia Absie is laboring for peace. 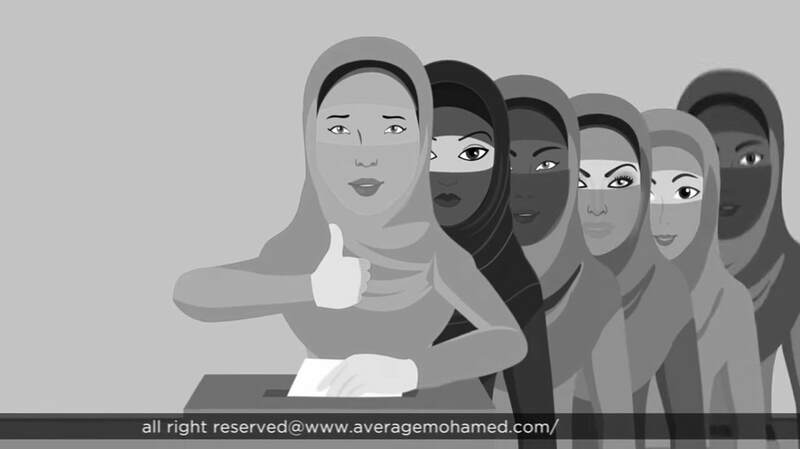 And by presenting videos that fight ideology with ideology, “Average Mohamed” is restoring Eden. These artists are building a community of shalom; they are participating in the creation of salaam. We have assembled this issue as a means to direct attention to the power of art to open paths of peace where previously none could be imagined, and to put a spotlight on the beauty and wisdom of the religion of Islam. The issue opens with Deborah Sokolove’s well-crafted review of Shirin Neshat’s Facing History exhibit, recently on view at the Smithsonian’s Hirshhorn Museum, in which Sokolove boldly states that Neshat is “one of the most courageous artists working today.” The artist, originally from Iran, is courageous because she dares to interrogate the ideologies that have put her into situations of exile from both the Eastern and Western worlds she has called home. Another Iranian contributes poetry to this issue. Eight poems by SAID, treating profoundly such themes as existence, desire, and mourning, are translated by our poetry editor, Mark Burrows. Next, a London-based researcher, Rosalind Parker, considers the British Museum’s mounting of an exhibit about the Hajj, and wonders whether audiences entered into a space configured more to elicit a religious experience than to present material in the didactic mode more characteristic of the British Museum­—ultimately arriving at the conclusion that the exhibit was both experiential and instructive. Lastly, we are publishing an article by Meena Sharify-Funk, an American Muslim scholar of Iranian ancestry. She discusses how Sufis were vital to the development of letter mysticism in Islam. John Shorb contributes an interview with Saudi-American artist, Hend al-Mansour. And Mark McInroy rounds out the issue with two new titles in theology and the arts, both with a focus on Islam. This publication has, for years, recognized the many ways that theology and the arts intersect—whether by drawing the viewer onto religious ground by asking questions of an ultimate nature, by providing the religious person with an object of devotion, by offering a prophetic critique of socio-political realities, by supplying a medium other than textual for historical reflection, or by bringing the religiously inclined face-to-face with the sacramental presence of that which is holy. In this issue, we are demonstrating that religion and the arts also intersect along an axis of fostering interreligious understanding. The Muslim artists and scholars who are featured in this issue—whether through applicaton of ink on photograph, curation of religious objects, recitation of poetry, or interaction with calligraphic text—are testimony to the breadth of Islam in a world that threatens to reduce a multi-cultural, beautiful, and complex system of faith into a one-dimensional image constructed by radical extremists. And they demonstrate that the arts remain vital in the expression of ultimate meaning for modern Muslims who are wrestling with socio-political realities emerging in a thoroughly interconnected world. As a professor, and as an editor of an academic journal, my work can at times seem an insufficient means by which to respond to the violence carried out in the name of religion, whether Jewish, Christian, or Muslim, or whether in the name of religion by yet another name: patriotism, militarism, or nationalism. Yet I am also deeply aware that education—especially education across identities of difference—is among a list of things that can provide hope in times like these. Educational encounters across distinct identities enable people to find one another’s humanity, and may convince us yet that non-violence is the only path to a common, peaceful future. Non-violence is, however, the more difficult trail to follow, and so it is the road less often taken—but it is a way that can only be followed when we can begin to see it. Artists are among those who are charting such a course. They illuminate our way. Our common future is reliant upon a willingness to follow the route they enable us to see. And so we are pleased to publish this issue as a means of encouraging interreligious encounter and promoting greater understanding in order, finally, to foster peace. Many Somali immigrants and their families live in the Cedar-Riverside neighborhood in Minneapolis. 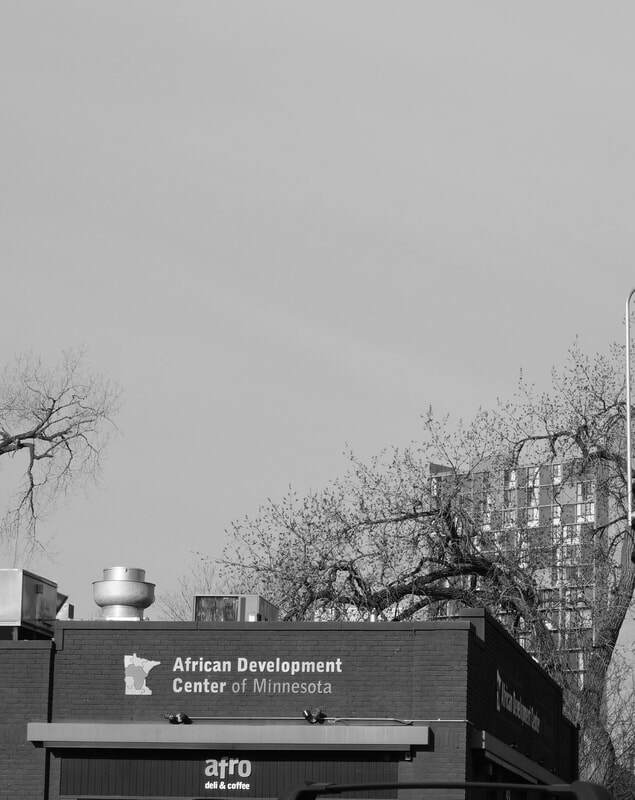 This apartment complex is located near the University of Minnesota in what is known as “Little Mogadishu.” Non-profit agencies provide support.